Just how quick was the great tyrant lizard, exactly? Experts in biomechanics think she was pretty damn quick – but still probably not as fast as you think. Researchers have been debating over the speed of dinosaurs – and T. rex, specifically – for years. Reconstructions of dinosaurs toward the end of the 19th century often depicted them as fast-moving creatures, but by the mid-twentieth century, that vision had been turned on its head. Large, bipedal theropods like T. rex were often presented standing completely upright, their tails dragging along behind them in a manner suggestive of slow, lumbering locomotion. The pair used data from known fossil models to reconstruct the dinosaurs' locomotive anatomies and musculoskeletal features. These models were then pushed to their limits in the GaitSym program, which ran each dinosaur's model through different combinations of muscle activation patterns. Patterns that caused the models to falter were abandoned, while simulations where the dinosaur ran at least 15 meters were investigated more thoroughly. This is the table we used to create the infographic up top. You'll notice the estimated speed for T. rex (8.0 meters per second) is smack dab in the middle of the "moderate range" of 5–11 ms-1 cited by Hutchinson. Dromaius, Struthio and Homo correspond to emu, ostrich and human, respectively. These numbers corresponded well with top speed data for all three species, and helped demonstrate the accuracy of the GaitSym model. The upshot: the smaller the bipedal theropod, the faster it runs (just look at that freaking Compy!). 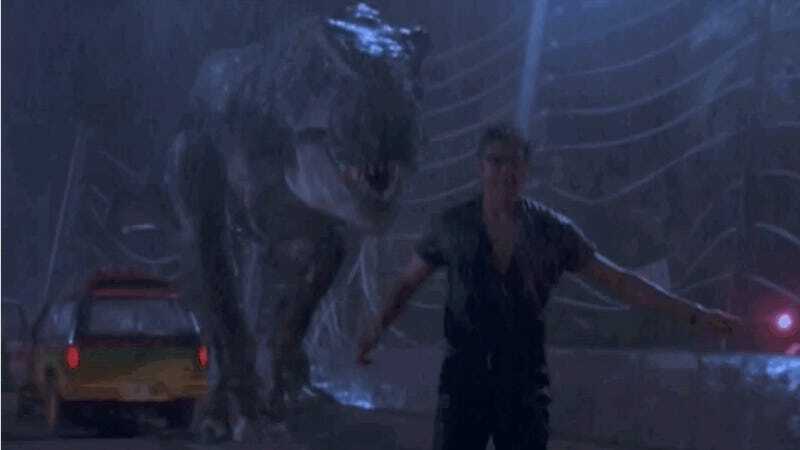 The good news is that according to Sellers and Manning's models, the monstrous T. rex would actually be the easiest of the simulated dinosaurs to outpace in a sprint for your life. The bad news? Considering the average T. rex clocked in at about .44 kilometers per hour faster than the average human, there's still a pretty good chance you're humped. I suppose the only consolation hidden in these findings is that when Sellers and Manning performed these simulations in 2007, they were still using model predictions that put T. rex's weight at 6,000 kg, but a study published by Hutchinson in 2011 put this figure at over 8,000 kg. If we go by the rule of bigger = slower, there's a chance the newer, larger T. Rex model would lag just a bit behind your average human. 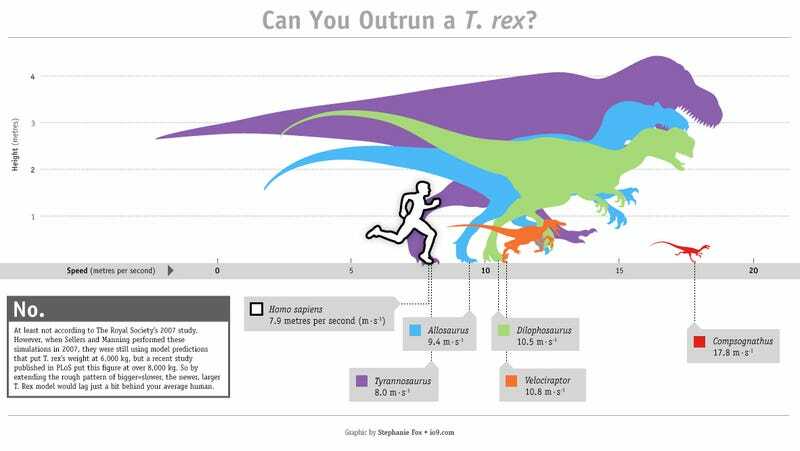 Unless T. rex really did run closer to 11 meters per second, in which case you're probably doomed no matter what. Top image by io9 graphics ninja Stephanie Fox; dinosaur speed table via Sellers and Manning. A version of this post appeared on io9 in 2011.